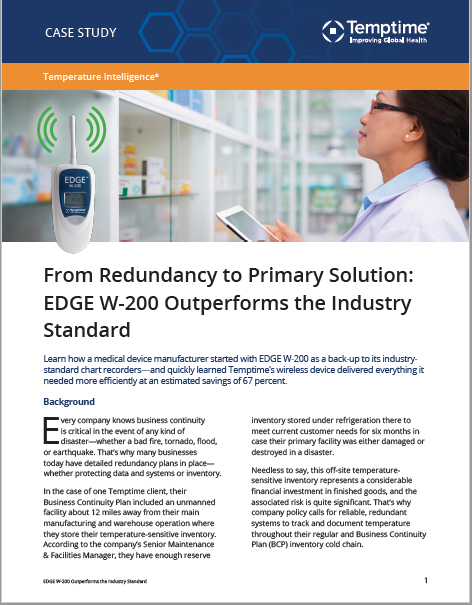 Learn how a medical device manufacturer started with EDGE TM W-200 as a back-up to its industry-standard chart recorders—and quickly learned Temptime’s wireless device delivered everything it needed more efficiently at an estimated savings of 67 percent. Every company knows business continuity is critical in the event of any kind of disaster—whether a bad fire, tornado, flood, or earthquake. That’s why many businesses today have detailed redundancy plans in place— whether protecting data and systems or inventory. In the case of one Temptime client, their Business Continuity Plan included an unmanned facility about 12 miles away from their main manufacturing and warehouse operation where they store their temperature-sensitive inventory. According to the company’s Senior Maintenance & Facilities Manager, they have enough reserve inventory stored under refrigeration there to meet current customer needs for six months in case their primary facility was either damaged or destroyed in a disaster. Needless to say, this off-site temperature-sensitive inventory represents a considerable financial investment in finished goods, and the associated risk is quite significant. That’s why company policy calls for reliable, redundant systems to track and document temperature throughout their regular and Business Continuity Plan (BCP) inventory cold chain. The company’s primary remote refrigeration monitoring system transmits temperature data to the cloud through a separate modem. On occasion, the cloud data stalls and it can take hours or sometimes even days for the data to catch up—which means the Senior Maintenance & Facilities Manager needs to stop what he’s doing at the main facility and make the 12-mile trek to the back-up facility to determine the status of the equipment and inventory. “Twelve miles may not seem like a lot,” he says, “But it can literally eat up half my day—wrapping up what I’m doing here before leaving, traveling back and forth, and checking that all systems are online and inventory is safe.” It also takes him away from the primary facility, creating a void in coverage and adding risks to operating efficiency and downtime should something happen while he’s away. 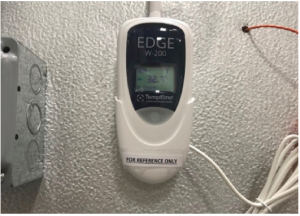 About a year ago, the company decided to test the EDGE™ W-200 wireless sensors as a back-up to their primary refrigeration monitoring system. Designed for long range connectivity, the EDGE W-200 is easy to install and use. It senses both temperature and relative humidity and stores up to 4,000 readings, which can be accessed via the EDGEConnectTM web-based application. 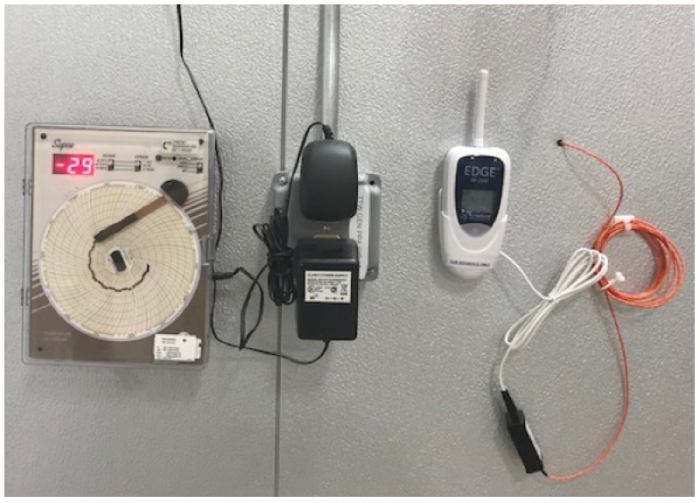 The chart recorder (L) and EDGE W-200 wireless, battery-powered sensor (R) are installed side by side on a large refrigerated storage unit. Note that the EDGE W-200 is battery-powered and requires no external power source, and data is wirelessly transmitted to the cloud. One night, the primary monitoring system data stalled during a defrost period at about 6:00 p.m. When the staff did their daily check at 9:00 a.m. the next morning, findings appeared to be consistent with a freezer failure. Since the recovery from the defrost hadn’t been downloaded, there was no way of knowing if the equipment had actually failed to come out of defrost or not. Before heading out to the back-up facility to check the equipment, the staff logged on to EDGEConnect first. They were quickly able to verify that the freezer had not failed at all and that the inventory was safe. This series of events caused them to think about additional benefits, so they performed an analysis to see what it would look like if they replaced all of their analog chart recorders with EDGE W-200 devices. In their primary warehouse, they have 35 chart recorders. The charts capture data for seven days, so every Monday a technician has to physically remove the old charts, and label and fit the new charts to each recorder. This takes about 3 ½ hours every week and results in over 1,800 chart changes each year. For the back-up facility, someone needs to travel to that facility and change out the charts every two weeks. Another cost is the chart paper itself, running $1,100 annually. It also takes 30 minutes of management’s time each week to review and archive the charts. Each chart recorder also goes through three battery changes per year on average, which adds another $210 for batteries annually, plus the labor to change them out. Each chart recorder must be calibrated semi-annually at a cost of $95 each, resulting in another $6,650 annual cost. The company also loses an average of four chart recorders each year due to calibration failures and the inability to correct drift. 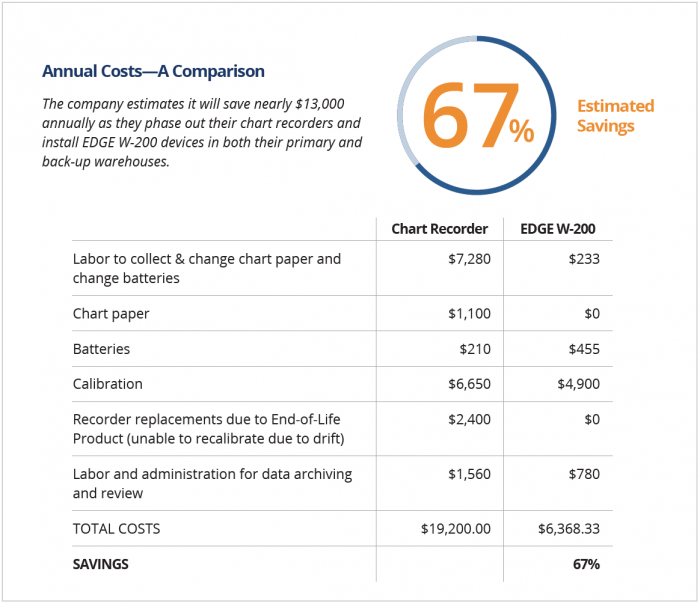 It costs as much as $600 to replace a chart recorder—another $2,400 annually. These expenses add up to just over $19,000 annually in chart recorder support (including staff time to collect and change chart paper and batteries as well as internal administration expenses). There’s also some risk involved in having third parties on site to perform calibrations. It’s not uncommon, says the Senior Maintenance & Facilities Manager, for a calibration technician to pull a chart recorder off its designated unit and accidentally re-install it on another. “That means the chart recorder that was on Freezer 3 ends up on Freezer 5, which we typically don’t discover until it turns into an audit finding, post calibration”. The EDGE W-200, on the other hand, is easy to install without the help of a technician. 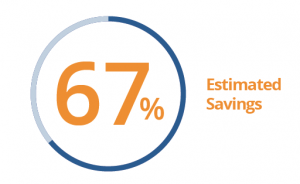 It saves administrative time because charts don’t need to be labeled, collected and reinstalled. It reduces costs related to semi-annual calibration and eliminates the cost and storage of the chart paper. It also saves on the recurring expense of the chart recorders, which have [an average] life expectancy of 2 ½ years—whereas the EDGE W-200 uses a long-life [1 year], replaceable lithium battery and only requires a single, annual calibration, which can be done internally. 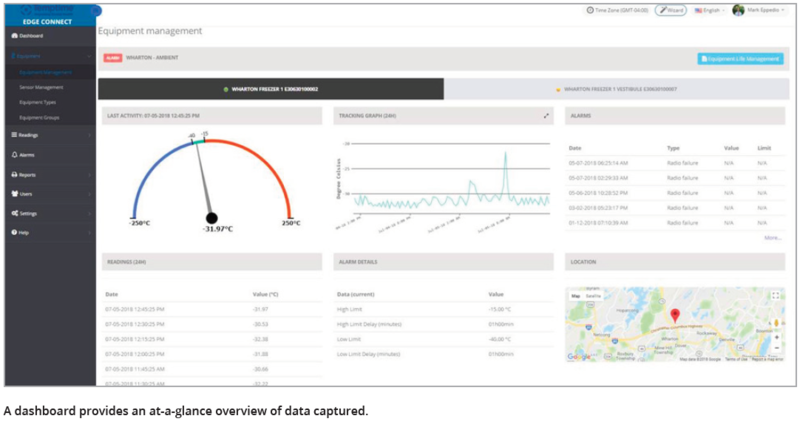 EDGEConnect Web enables you to visualize your EDGE W-200 sensor status and data, with a complete management interface for configuration and system administration.